That way, you not only know what is required to allow your company to grow, but you also always have knowledge and insights readily available when an audit is carried out. This saves you time, money and a tonne of frustration. Which activities generate the most revenue? Which business processes are most susceptible to external influences? How much does your core business really cost? Where data is generated, metadata is often created: information that describes the properties of other information. This metadata is actually data about data. Are you interested in the possibilities of DDM Studio? Are you a ‘newbie’ in the area of data management, or have you already started multiple BI projects that were unsuccessful to a greater or lesser degree? Whatever your level, we will guide you to the final destination – even if your data management seems to be in order. There is always room for optimization. We have BI consultants in-house that are not only well-trained, but are also genuinely interested in data and its possibilities. People who dedicate themselves to delivering crystal-clear data for you. Data that is understandable, and data that you can do something with. 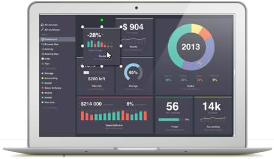 With DDM Studio, our business intelligence software, and supplementary services, we deliver a total package. DDM Studio enables you to solve complex problems. That’s because DDM Studio creates as many cross-links as possible between various sources. The next step in data management! We are not only a specialist in the area of data management and data warehousing, but also true doers. We roll up our sleeves and get to work pragmatically for you. For this, it does not matter if your company is large or small. DDM Studio and our services are highly scalable, so that we can offer a suitable solution for every organization. We honour our commitments 100% and often deliver a bit more than what was agreed on. Along with software development and data governance, service is in our blood. What do you achieve with us? HappyToServe.com can now develop and maintain reports in-house, without being dependent on an IT specialist. Subscribe to the OceanBI newsletter and stay up-to-date with the latest trends and interesting news.